St. Lucia just might be paradise. Situated in the eastern Caribbean, this small island — just 10% of the size of Miami-Dade County — enjoys a tropical climate that is moderated year-round by pleasant northeast trade winds. Volcanic in origin, St. Lucian peaks rise more than 3,000 feet from the Caribbean Sea, and the island features diverse habitats including rainforest, dry forest, banana/cacao plantations, and gorgeous beaches. This landscape is home to a wide variety of unique plants and animals, including 5 endemic bird species (meaning they are found no where else in the world). It was these unique birds that first drew my attention. After a burst of planning I had a 5 day itinerary and a pair of frequent flyer tickets for my girlfriend and I to enjoy. Upon landing I adjusted my driving style to favor the left and began zigging and zagging along mountainous roads along the southern shore. It wasn’t long before the amazingly beautiful Pitons came into view. These remnant lava domes are 2,500 feet of sheer rock (and beauty!) and are preserved as part of a UNESCO World Heritage Site. 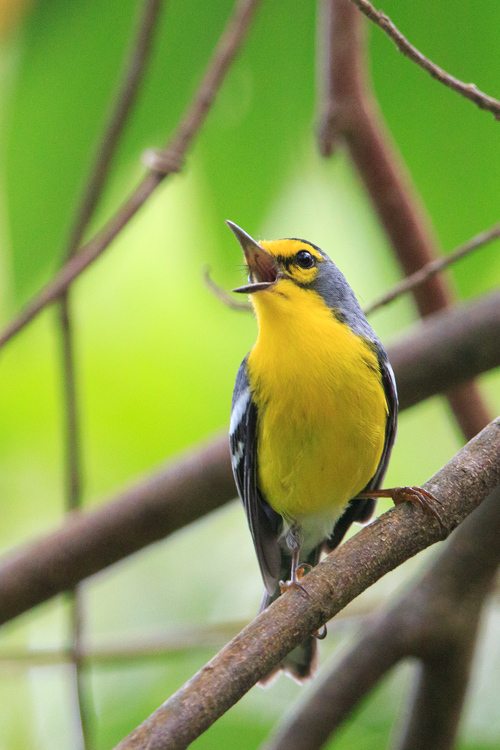 The first endemic bird that caught my eye was the lovely St. Lucia Warbler. 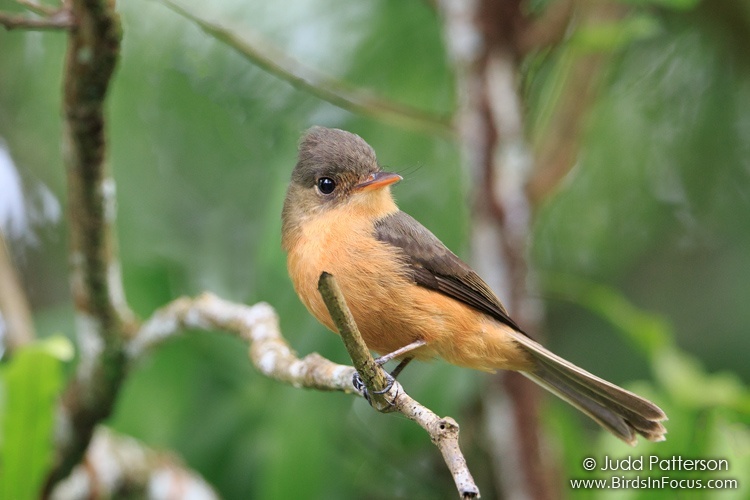 They are relatively common on the island, and in late April numerous males were signing from the treetops. 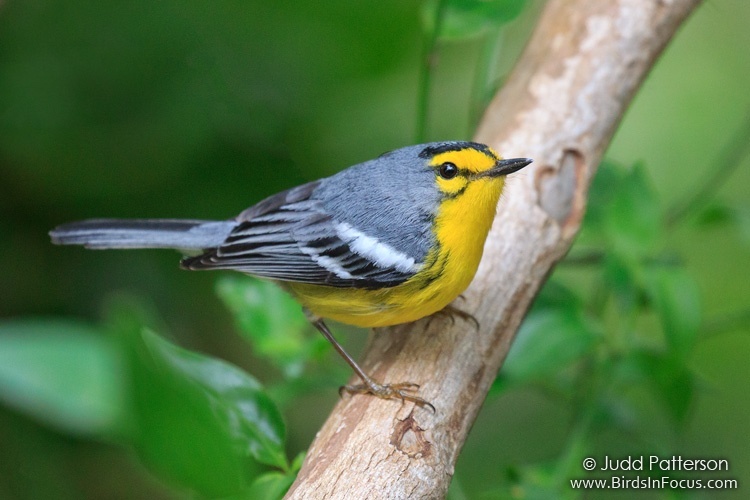 Until recently the AOU lumped this species with the similar Adelaide’s Warbler (Puerto Rico) and Barbuda Warbler (Barbuda), but differences in song, plumage, mitochondrial DNA, and range mixed things up (in 2000) and will probably keep this one split. We were fortunate to spend a day birding with Adams Toussaint who works for the St. Lucia Forestry Department. Adams is a top-notch guide with an knack for finding good birds, and a broad understanding of the issues facing St. Lucia. As we chatted about threats from causeway construction, hotel development, and a dolphin park we walked through beautiful forest and continued to discover new birds. The next endemic is known as the St. Lucia Pewee by many authorities, while Clements/eBird still calls it the Lesser Antillean Pewee. I really loved the rich rufous of this spirited little flycatcher. We noticed one individual had a bad eye, but remarkably that didn’t seem to stop it from grabbing in-flight insect snacks from a favorite perch. 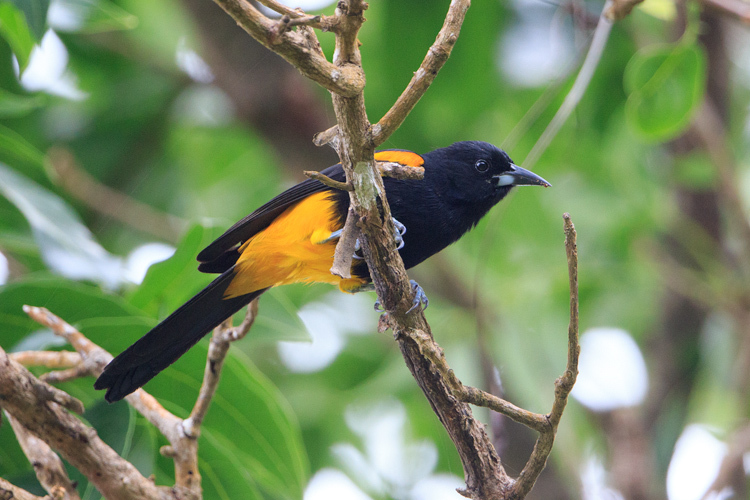 As our adventure continued we saw the St. Lucia Oriole at a few locations across the island. Like many of the endemics, it is not abundant (estimated population of just 1000-2500) and it is is under threat from an increasing population of Shiny Cowbirds that lay their own eggs in oriole nests. 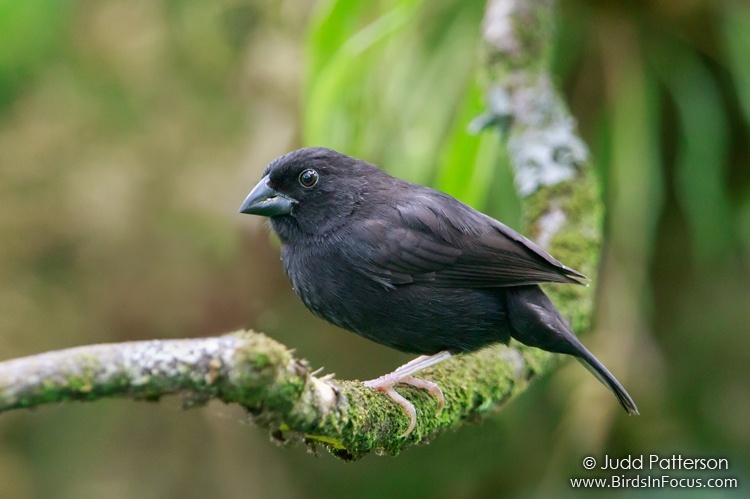 Endemic #4 is the St. Lucia Black Finch. It’s frequently mentioned that this bird shares a family tie with the Galapagos finches. As members of Thraupidae (Tanagers and Allies) this is technically correct. However, this same family also includes Bananquits, grassquits, and Antillean bullfinches, so the mystery is not as deep as it may seem at first blush. It’s a beautiful little bird that is endangered (estimates of 250-1000 remaining) and difficult to photograph. With help from Adams we were able to get close to a cooperative male finch, and a cloud provided the perfect, soft light. Saint Lucia’s remaining Amazona versicolor population of 150 ±25 is fast approaching extinction in the wild … and considering the overall trend of man’s simplification of Saint Lucia’s ecology, it is certain that Amazona versicolor will not escape oblivion. 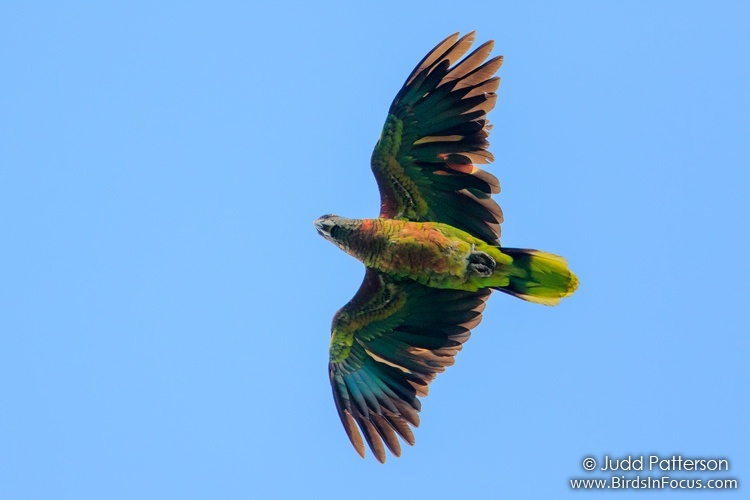 Those are scary words to read from a researcher who knew these parrots so well. Thankfully during the 1970’s and 1980’s there were a number of positive changes. In 1979 St. Lucia gained independence from the UK and they quickly named the parrot as the national bird, enacted new wildlife protection legislation, and initiated a captive breeding program. 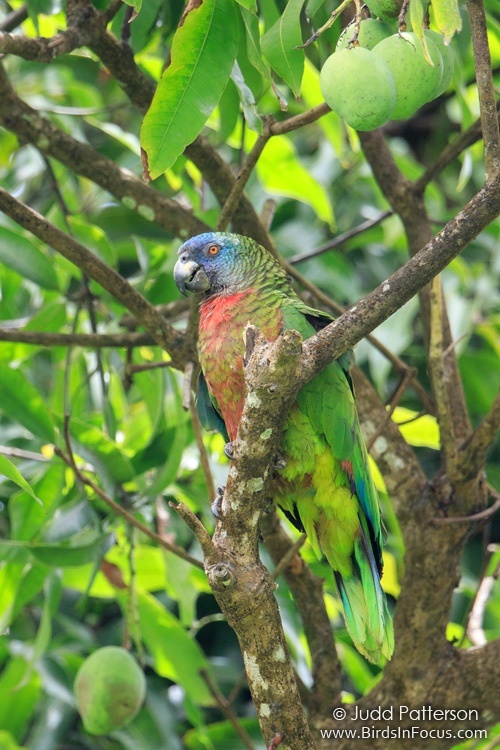 The success of these measures is obvious today and parrots now number 350-500 and the population continues to expand. Our 5 days exploring St. Lucia came to an end all too quickly, but I was very happy to have seen and photographed all 5 endemic species and a wide variety of other Antilliean endemics such as the Gray Trembler, Purple-throated Carib, and Lesser Antillean Saltator. For such a small island, St. Lucia has a lot to offer to a nature enthusiast. I would highly recommend the wonderful combination of amazing views, outstanding food, and beautiful birds that is St. Lucia!